This system was visited for the first time on EDSM by Geo Panagon on Mar 15, 2016, 9:32:22 PM. 971 ships passed through Shrogea MH-V e2-1763 space, including 3 ships in the last 7 days. 0 ship passed through Shrogea MH-V e2-1763 space in the last 24 hours. Tranquility’s Stop maintains a tourist installation in orbit of the black hole within a planetary nebula found in Shrogea MH-V e2-1763. 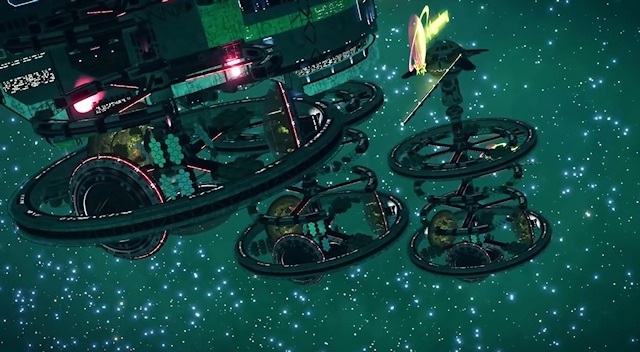 The installation was constructed in the vicinity of the preexisting 'Black and Green' Tourist Beacon and two satellites giving Engineer Data are also found adjacent to the facility. In March 3304 the location was featured in the 'Strange Worlds' travel documentary. NOTE: No starport services are available at this facility.